Sculpt-It is ideal for freehand modeling and creating realistic sculptures. No kiln or heat baking is required. It is non-toxic, ideal for children who are old enough to work with modeling or polymer clays. It dries to an almost ceramic hard surface with minimal shrinkage, and can be moistened while pliable for piece-to-piece adhesion, smoothing, and blending to avoid cracking. Paint the finished piece when it is dry, or leave it unpainted for that natural look. Sculpt-It Colors, 6 Jar Set — This 6-jar set of Sculpt-It colored sculpting material lets you do beautiful freehand modeling in color. Contains ¾ oz (21 g) jars of Yellow, Green, White, Red, Blue, and Purple. Colors can be blended together to create new colors or unique marbling effects. Sculpt-It Classroom Pack, Package of 150 — This convenient classroom pack includes 150 individually wrapped packages of White Sculpt-It. Each package contains .67 oz (19 g). 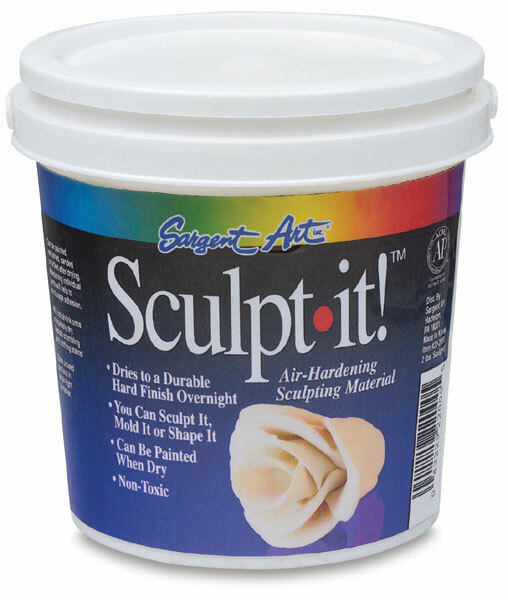 ® Sargent Art is a registered trademark.™ Sculpt-It is a trademark.